INNERCAP Technologies, Inc., a drug delivery company, offers an advanced patented multi-phase, multi-compartment capsule-based delivery system. The system can be used to enhance the value and benefits of pharmaceutical, biopharmaceutical, medical food, nutraceutical and nutritional, dietary supplement and herbal products. Utilizing two-piece capsules, the technology offers the industry solutions to problems affecting pharmaceutical companies, patients and healthcare providers. 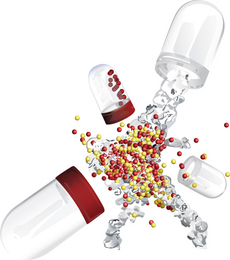 INNERCAP can fill a company’s pipeline with a multitude of combination product therapies. phases with controlled release profiles. The delivery system is an exciting solution that will be used by forward looking companies to overcome issues such as life-cycle management, compliance, bioavailability, stability, difficult combination drug therapies and other combination products. INNERCAP is working with leading companies to develop and manufacture unique combination products using INNERCAP's proprietary delivery system for advanced products to meet unmet needs in the marketplace. Reserve the products that can fill your company’s pipeline and increase shareholder value for the future. Contact INNERCAP Technologies, Inc. today to discuss opportunities to develop and commercialize advanced combination products today!